Why Cocoa Butter? Because Coconut Butter is a triglyceride (fat) of vegetable origin, which hydrates, conditions, moisturizes and brightens hair. Aplication: Apply a small amount of Moisturising Mask Capilo Pro B-Natural on wet hair and massage. Rinse. Repeat if necessary. 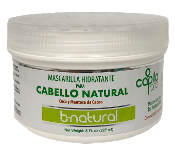 Aplicación: Aplique una pequeña cantidad de Mascarilla Hidratante Capilo Pro B-Natural sobre el cabello húmedo y friccionar. Enjuagar. Repetir si es necesario. Warning: Avoid contact with eyes. In case of accidental contact, rinse with cool water. If symptoms of irritation or other adverse reaction appear discontinue use immediately. For external use only. Keep out of reach of children. For Professional Use Only. Advertencia: Evite el contacto con los ojos. En caso de contacto accidental, enjuagar con abundante agua fría. Si aparecen síntomas de irritación u otra reacción desfavorable descontinue su uso inmediatamente. Para uso externo alcance de los niños. Ingredients: Water(Agua), Cetyl Alcohol, Glycerin, Catrimonium Chloride, Cetearyl Alcohol, Behentrimonium Methosulfate, Hydrogenated Ethylhexyl Olivate, Hydrogenated Olive Oil Unsaponifiables, Stearyl Alcohol, Theobroma Cacao (Cocoa) Seed Butter, Cocos Nucifera (Coconut) Oil, Fragrance, Methylisothiazolinone, Iodopropynyl Butyl Carbamate.